﻿ Nani: "Cristiano Ronaldo is anxious to see Manchester United winning the EPL title"
30.04.2012 » Nani: "Ronaldo is anxious to see Manchester United winning the EPL"
Nani and Cristiano Ronaldo have been good friends since they met each other at Sporting CP, many years ago. 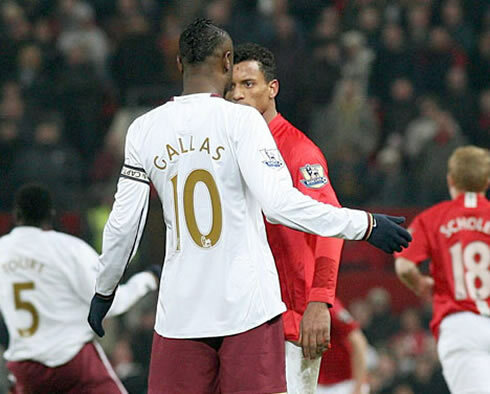 They both had similar career paths, as they moved to Manchester United still at a very young age. 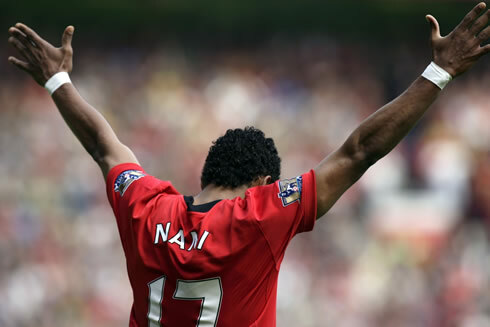 However, Nani confesses he keeps trying to get away from the "Ronaldo" label and comparisons, because he wants to have his own journey in football and Manchester United is precisely where he intends to stay in the years to come. The city of Manchester is in turmoil, as United and City will fight for the title later on, in the Etihad Stadium. The Red Devils winger, Nani, granted an interview to "The Sun" newspaper this Sunday, disclosing his desire of ending his career at the club, as well as a few details from chats he often has with his good old friend, Cristiano Ronaldo. According to Nani, Ronaldo keeps supporting Manchester United from distance and will certainly be one of many millions following the derby tonight. Nani also revealed that Cristiano is desperate to see Manchester United becoming English champions this season. As for the Spanish lands, the title decision may very well take place this Wednesday, since Real Madrid will visit Atheltic Bilbao and Barcelona will host Malaga. A victory will be enough for the Merengues to celebrate La Liga 2011-2012 title. 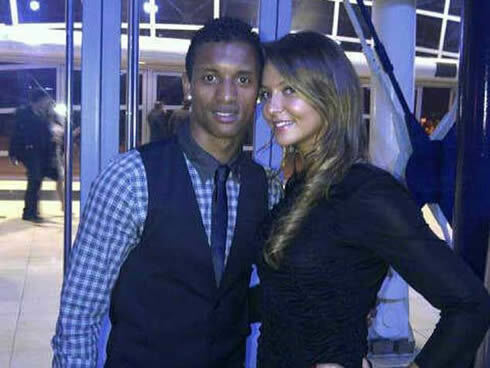 After announcing his engagement with his girlfriend Daniela Martins just a few days ago, Nani had a chat with the British newspaper, "The Sun" and took the chance to reveal his expectations for the future, as well as making a short balance of his stay in Manchester United. Nani, who is now making his 5th season for the club, moved to England in 2007, in a £25 million pounds transfer fee, from Sporting CP. Nani: "I left Portugal back then, because this move represented a huge personal challenge and I really wanted to improve as a player. It's obvious that there have been moments where things weren't easy, but I've always been treated very well, and step by step, I've accomplishing my dreams. Manchester United is my home! ", remarked the Portuguese winger. 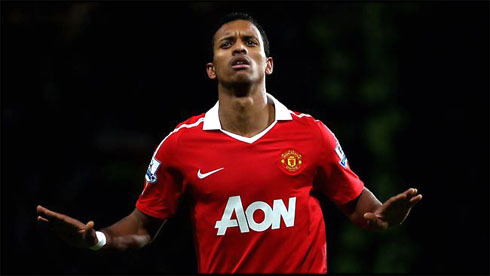 With 27 appearances in the Barclays English Premier League this season, from which he scored 8 times and assisted his teammates in 10 occasions, Nani believes his work is being appreciated and that there is a good chance of him signing a new long-term deal very soon. 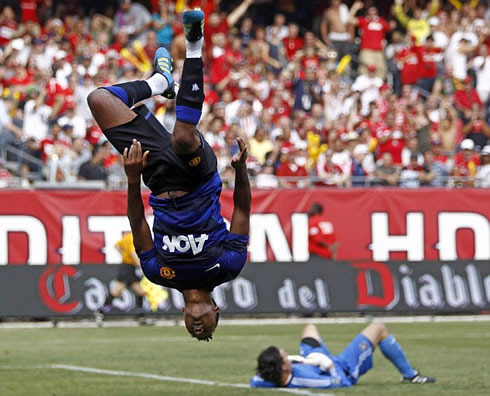 Nani: "Our coach [Sir Alex Ferguson] has great confidence in me and that's all that matters at the end of the day. My agent is already negotiating a new deal with the club and things are evolving in a positive way. Hopefully, everything will be sorted out by the end of the season", stated the Portuguese, who is said to be close to agree a new contract with Manchester United until 2016. It's no surprise to anyone whenever a current or former player of Manchester United praises the club's coach, Sir Alex Ferguson. 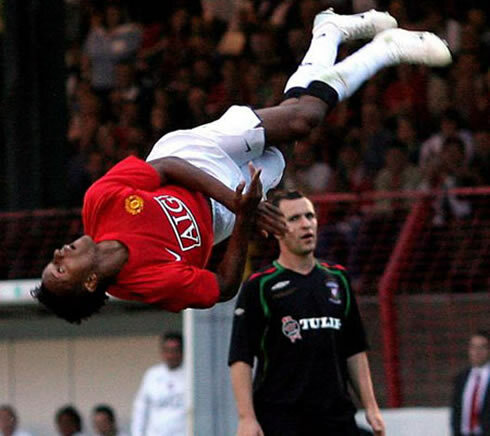 Cristiano Ronaldo has done it repeatedly in the past and Nani is no exception. 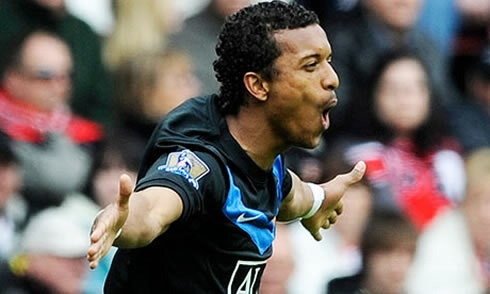 Nani: "Sir Alex Ferguson is a great manager, the best in the World in my opinion. I used to tremble in fear when I noticed he wasn't happy with something I did. I can recall a few games where we were up by 2 or 3 goals and still, he wasn't totally happy with our team", pointed out Nani, who also holds high hopes for the upcoming EURO 2012 campaign with the Portuguese National Team. As for the constant comparisons between himself and Cristiano Ronaldo, Nani doesn't appreciate them that much, simply because he's been trying to cut himself off from the "Ronaldo label" and set his own path and name in football. Nani: "I'm always in contact with Cristiano Ronaldo and he has certainly been a great support I've had in my first years at the club, just like it was Carlos Queiroz and Sir Alex Ferguson. However, I don't like it when people start comparing me with Ronaldo, as football players. We don't play in very similar ways, since we bring different things to the team on the field. Unfortunately, everyone got used to compare me with Ronaldo and there's not much I can do now", said a dissatisfied Nani on his interview to "The Sun". The Red Devils' winger also revealed that Cristiano Ronaldo remains being a Manchester United fan and that he is eagerly waiting for the club to clinch the Barclays English Premier League title. Nani: "As far as I can tell, Cristiano Ronaldo is still a great Manchester United fan and he's definitely anxious to see the club becoming champions again! ", revealed the Portuguese international. Cristiano Ronaldo isn't likely to leave Real Madrid in a near future, but if that ever happens, United will surely be his first destination of choice! Real Madrid next game will be for La Liga, against Athletic Bilbao, this next Wednesday (02-05-2012). You can watch Juventus live stream, Athletic Bilbao vs Real Madrid, Barcelona vs Malaga, Manchester City vs Manchester United and Bolton vs Tottenham, all from our football live streams section. Cristiano Ronaldo will most likely be on the line-up, when Real Madrid visits Bilbao.